To download Visual Studio 2013, click on the download button. The files are downloaded from our free Dev Essentials subscription-based site. Please see the Dev Essentials page for information on our free comprehensive developer program and services. 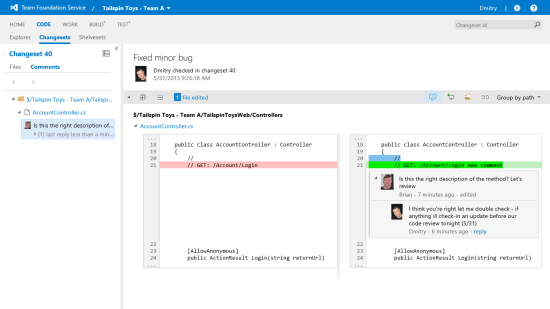 Visual Studio 2013 included many user interface improvements based on customer feedback and Microsoft's core design principle of keeping the focus on the content to deliver an improved user experience. You may notice the more than 400 modified icons with greater differentiation and increased use of color, a redesigned Start page, and other subtle design changes throughout Visual Studio. 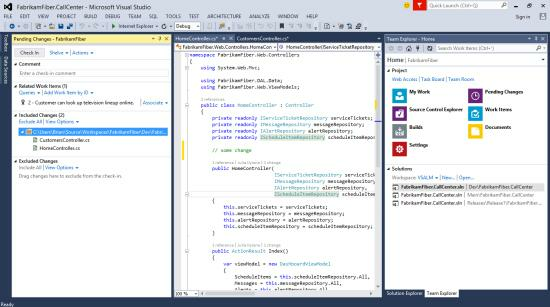 Visual Studio 2013 included a number of improvements to help you be more productive and stay focused when coding. Some features first appeared as experiments in the Visual Studio Power Tools extension before being refined and incorporated into Visual Studio. Productivity features such as automatic bracket completion, the ability to move code lines or blocks using keyboard shortcuts, and in-line navigation are now built-in. 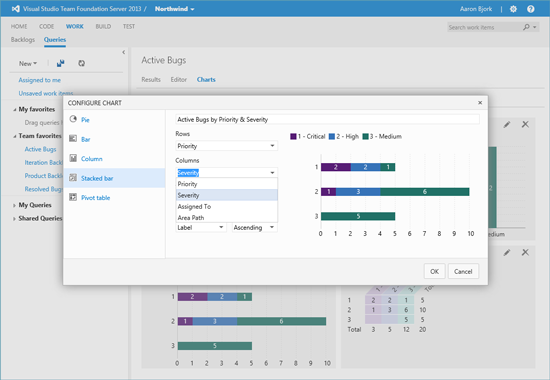 In addition, Visual Studio 2013 includes a new Team Explorer with an enhanced Home page that provides easier navigation to team collaboration features, including the ability to undock Pending Changes and Builds into a separate window. When you work with large code files it can be hard to keep track of where you are. In Visual Studio 2013, you can easily switch the behavior of the scroll bar between two modes. In bar mode, you can view annotations such as your caret position, change your location, and track errors more directly. In map mode, the scroll bar shows a live preview of source code as well as the ability to hover over code to preview it greater detail within a tooltip. You can then click on the exact code position which navigates to that location. Understanding what a line of code does is a key task during development. The Go To Definition command is now accompanied by the new Peek Definition feature. With Peek Definition you no longer have to leave the context of your line of code to view a definition in an inline view. Understanding what a line of code does is only part of your challenge as a developer. You must also understand its history, who worked on it, what code references it, and more. This becomes especially challenging in team-oriented projects. 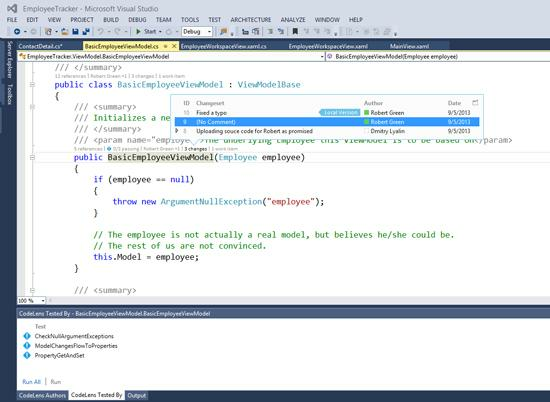 CodeLens (Code Information Indicators) in Visual Studio Ultimate 2013 uses information from both your project metadata and Team Foundation Server 2013 to place decorators on each of the methods in your code that show information such as what changesets led to the creation or recent change, who was the last person to work on the code, what unit tests cover the method (including the latest pass/fail state), and what code references exist. You can also quickly jump into that data, such as an associated changeset or referenced code file with just a click. 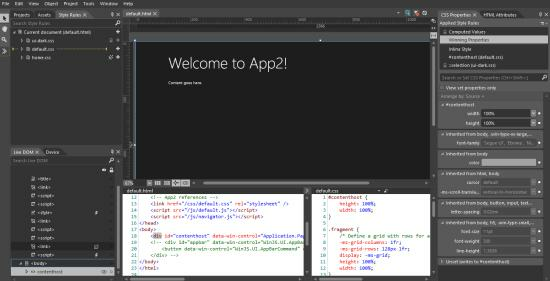 Visual Studio 2013 introduces a connected IDE experience, enabling you to get started with Visual Studio 2013 more quickly. When you start Visual Studio 2013 for the first time, you will be asked to sign in using your Microsoft account. You may already use the same account with your MSDN or Team Foundation Service subscriptions. Once signed in, your copy of Visual Studio 2013 is registered for your use without the need for any extra steps. Visual Studio 2013 will also automatically synchronize settings across your devices utilizing the Connected IDE experience. Synchronized settings include categories such as keyboard shortcuts, Visual Studio appearance (theme, fonts, etc.) and more, all while keeping you in full control through the Synchronized Settings options. Visual Studio 2013 provides the ideal toolset for building modern applications that leverage the next wave in Windows platform innovation (Windows 8.1), while supporting devices and services across all Microsoft platforms. 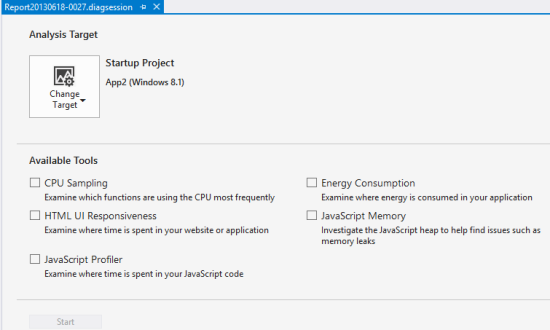 Support for Windows Store app development in Windows 8.1 includes many updates to the tools, controls and templates, new Coded UI test support for XAML apps, UI Responsiveness Analyzer and Energy Consumption profiler for XAML and HTML apps, enhanced memory profiling tools for HTML apps, and improved integration with the Windows Store. Creating websites or services on the Microsoft platform provides you with many options, including ASP.NET WebForms, ASP.NET MVC, WCF or Web API services, etc. In the past, working with each of these approaches in Visual Studio meant working with separate project types and tooling isolated to that specific project's capabilities. The One ASP.NET vision unifies your web project experience in Visual Studio 2013 so that you can create ASP.NET web applications using your preference of ASP.NET component frameworks in a single project. 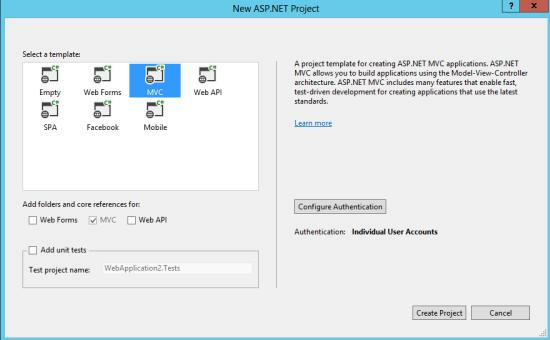 This new unified experience includes the ability to easily create hybrid applications that include improved versions of ASP.NET WebForms, MVC or Web API, all in a single project. Now you can mix and match the right tools for the job within your web projects, giving you increased flexibility and productivity when developing for the web. If you design web pages, or implement the designs of others, you probably spend a significant portion of your time tweaking HTML and CSS while refreshing browser windows again and again to achieve the exact experience you want to create. This is further complicated by the diversity of available web browsers your visitors might be using to view your site. Visual Studio 2013 eliminates this back and forth using Browser Link, which connects Visual Studio to one or more open modern browsers in an interactive development experience to keep them in synch with your markup changes without needing manual browser refreshes to see the changes you are making. With Visual Studio 2013, you can create and manage modern business applications that extend the Office 365 experience to help people interact with business processes, artifacts, and other systems. Office 365 Cloud Business Apps run in the cloud, taking advantage of the rich platform capabilities exposed by Windows Azure and Office 365. As cloud-based apps, they are available to a myriad of devices to aggregate data and services from in and out of an enterprise, and integrate user identities and social graphs. These applications integrate with the application lifecycle management capabilities of Visual Studio, bridging the worlds of the business app developer with IT operations. 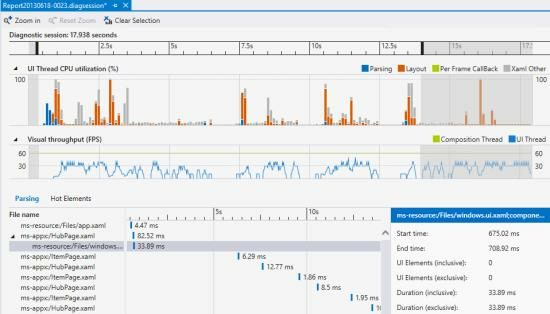 The new Performance and Diagnostics hub in Visual Studio 2013 provides a unified experience for various tools available in Visual Studio. The hub also makes it easy to identify the performance and diagnostic tools that work with your project and enables you to quickly start using them to improve your application. Memory Dump Analyzer in Visual Studio 2013 makes it easier to diagnose memory problems in production environments by analyzing .NET memory heap dumps right from Visual Studio. Using the new memory analysis capability, you can solve memory leaks and inefficient memory usage by seeing size and counts, the largest instances of objects, and what is holding them alive in memory. You can also compare two memory dumps to gain insight into how memory usage is changing over time. In addition to features that improve support for C++11, such as delegating constructors, raw string literals, explicit conversion operators, and variadic templates alongside "just my code" debugging in Visual Studio 2013 makes working with C++ even better. The ability to filter the call stack down to just the code you wrote when debugging has long existed for managed languages and is now available for C++. Visual Studio 2013 incorporates a wave of new Application Lifecycle Management (ALM) features that will help your teams be more productive and collaborate with improved support for agile development practices that you can adopt incrementally to suit the needs of your organization. Features such as agile portfolio management, team rooms, web-based code comments on changesets/commits, and web-based test case management improvements are part of an integrated solution to help your team collaborate better and increase productivity. The core for Visual Studio's ALM capabilities is provided by Team Foundation Server, which can be installed on a server on premises, or Team Foundation Service, which is hosted in the cloud. Whether the team prefers the increased control and customization of an on-premises installation, or the maintenance-free accessibility of the cloud, there's an option that fits your team's needs. Buying Visual Studio with a Visual Studio Subscription is the most popular way to purchase Visual Studio and gain access to the most comprehensive collection of software, services, and benefits for targeting Microsoft platforms. 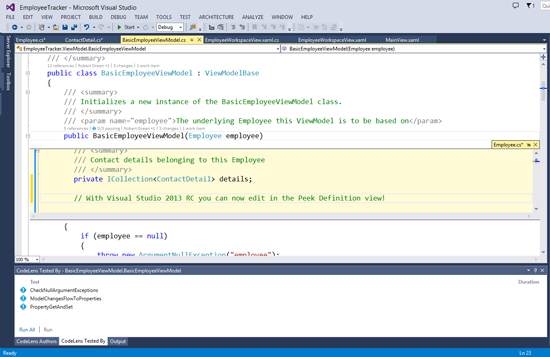 Active Visual Studio subscribers will have the earliest access to the final release of Visual Studio 2013 in mid-October. 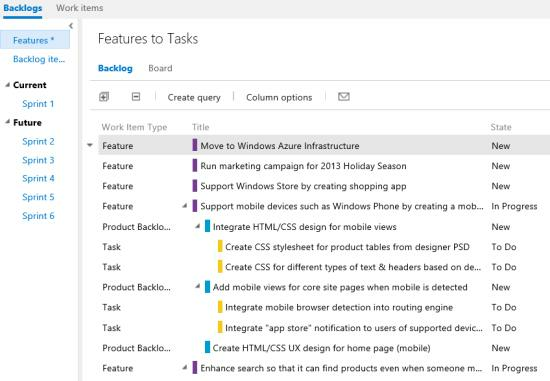 With the release of Visual Studio 2013, agile project planning capabilities are now more accessible for project managers with Backlog Management and Sprint Planning capabilities available for Team Foundation Server 2013 Client Access License (TFS CAL) customers at no additional cost.